BASSOON Tracker is a free web application that gives you full control over an Amiga music tracker and player. The Commodore Amiga, the successor of the Commodore C-64 home computer, was a very popular home computer back in the 80's and 90's. Among the many strengths were excellent graphics and sound capabilities; this led to a thriving games and demo development scene. Anyone could just fire up a free program like Soundtracker on the Amiga to start composing music or to play music on the device. Musicians benefited from extra hardware like a sampler that you could connect to the Amiga to record new music samples. Considering that the original Amiga had only 512 Kilobytes of memory (which you could extend), and that the memory had to be shared, it is quite astonishing how well music sounded on the Amiga. The interface may look intimidating on first glance; new users may want to play some of the demo songs listed on the lower left side of the interface to get a feel for the capabilities. I suggest you check out Stardust or Lotus 2 to get a feel for the capabilities. One of the greatest strengths of the player is that its developer has added support for several popular Amiga music databases and local file playback. Just select File > Load Module, and select a song from one of the available sources. Supported are Mod Archive, Modules.pl, Dropbox, Bassoon, and local songs. The song listings lack search capabilities though which means that you will have to scroll a lot to find songs of interest. Another thing that is missing is support for playlists; you can only play individual songs right now. A click on the play button starts playback right away. The player displays the entire composition in its interface while the song is playing so that you can learn a thing or two from good composers. The song composing part of the music tracker supports major features: load, play and edit samples, use the integrated piano, edit different tracks, and save modules that you have created using the tracker. 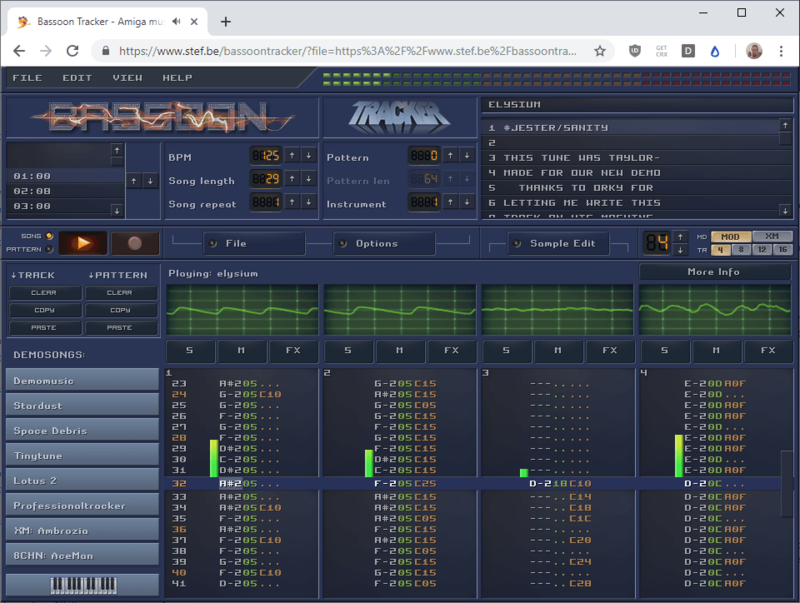 BASSOON Tracker is a great web application for Amiga veterans and others interested in music and especially the Amiga music scene. Most of the features that you'd expect from a tracker are implemented already, some, like playlist support, would be really handy to improve usability. Now You: What is your take on Amiga music and today's music? My brother is really into Commodore/Amiga has several old computers from back then and was looking forward for the companies return a few years ago. I guess they ran into legal problems though. I even downloaded Commodore OS for him since it was only available through a torrent download, we used Ubuntu’s Transmission program. Anyway I’ll share this article with him I’m sure he will be interested. You wake up memories almost forgotten. Similar trackers could be found for the PC demo scene as well. MOD tracker and others, I have difficulty to recall right now, are among them. Was the years Sound Blaster made debout and everyone and their mothers wanted to have one, 8-bit ISA & MCA. Hearing track “Space Debris” felt like coming home as a teenager. Anybody remembers the legendary Assembly demoparties? Never went to these parties but was always excited to see what came out of the various competitions. Yeah it’s a pure nostalgia exhibit, good work! This stuff died out more than 20 years ago. There were trackers for the PC as well, the most biggest was Impulse Tracker. For a short time the Amiga was miles ahead of everything else but the management ran it into the ground even ahead of time. Yep, that was awful. Cd32 was such a bad decision..
Thats right, they treated it like a console after Jack Tramiel was gone. The initial catastrophe was to dissolve the design team when the 500 was done and everything after that was kind of underwhelming. There are still some good old MOD player programs that run on Windows. ModPlug is my personal favorite. It still runs on Win 10. Lots of hardware is being produced today, both for the old “Classic” Amigas and new stuff. For example, do a search for the flagship AmigaOne X5000. You might be surprised. New software comes out daily, free, indie and even commercial, boxed releases. Some brilliant games too, and several magazines, both printed and online. A new, massive AmigaOS upgrade, version 3.1.4 for classic 68K Amigas has been released in September 30, 2018. The Amiga community is fully active, vibrant and present in all corners of the world, keeping the Amiga spirit alive. I see the nostalgia in firing up a sound tracker through a browser but there’s no need for that: great Amiga hardware is available, new and old. Also, fully mature Amiga emulators will do a tracker way more justice than any browser ever will. And remember: only Amiga makes it possible. I first got on the ‘net with an Amiga 1200 with a wonky accelerator board in it. Got my 1st windows computer in 1997.& my last 1 in 2014. “Considering that the original Amiga had only 512 Kilobytes of memory…” Actually, the Amiga 1000 shipped with 256KB. The A500 had 512KB, which could be upped to 1MB with a clock/RAM expander installed in the bottom “trapdoor.” I modded mine to 1MB chip + 2MB fast with a “sidecar” and added a SCSI HD. Nice to see tracker technology on the web!